The Donegal South-West candidate has to amend his election bio, after clarifying that he never finished a college course. SINN FÉIN’S spokesman on the economy, Pearse Doherty, has been forced to clarify the nature of his professional qualifications after a national newspaper queried whether his official biography was correct. The Irish Daily Mirror today pointed out that while Doherty’s biography on the Donegal Sinn Féin website – and on the official Sinn Féin election website – claimed him to be a ‘civil engineer’ by profession, he was not entitled to claim such a title. This was because the Civil Engineering course he had enrolled in at Dublin Institute of Technology in 1996 was a three-year course – but he left it after two years to take on a job in the industry, leaving with a qualification as a civil engineering technician but not as a qualified engineer. He had later returned to college in Letterkenny IT – in another Civil Engineering course – but had not completed the course, having dropped out to run his unsuccessful general election campaign in 2002. When pressed by the Mirror, Doherty said he was entitled to list civil engineering as his profession, as that was the industry in which he worked – but conceded that he should not have been listed as a ‘civil engineer’. “Our opponents are going to use this in trying to blow it out of all proportions,” he added to Donegal’s Highland Radio this afternoon, adding that he had “always been upfront” about how he had not completed his third-level education. Doherty explained that there had been a simple mistake on his profile on the Donegal Sinn Féin website, which has since been amended to clarify his career as a ‘civil engineer technician’. His biography on the central Sinn Féin website, however, retained the title of “civil engineer” – without the added ‘technician’ – at the time of publication. Doherty is expected to retain his Donegal South-West seat in Dáil Éireann, which he won in a by-election in November following a successful High Court challenge against the government’s refusal to hold the ballot for the empty seat. Email “Sinn Féin's Doherty forced to clarify job qualifications”. 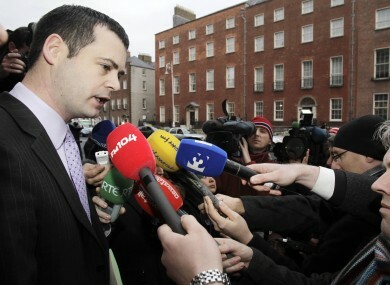 Feedback on “Sinn Féin's Doherty forced to clarify job qualifications”.